As the secretariat to the All Party Parliamentary Group for European Reform, Open Europe has prepared a new report looking at EU free movement and the lifting of transitional controls on Bulgaria and Romania in 2014. As well as including the outcome of the APPG’s public discussions, held in March, with the Bulgarian and Romanian ambassadors, the report addresses, in some detail, the hot topic of EU migrants’ access to welfare. The report also includes written submissions from the Bulgarian and Romanian governments, and the UK's Department for Work and Pensions. It is therefore a comprehensive guide to how the EU rules on access to benefits work and why the UK's particular welfare system needs safeguards such as the 'right to reside' test, which the Commission has decided to contest at the European Court of Justice. It is particularly interesting to see how different welfare systems across Europe are, not simply in terms of their outright generosity, but in how they are funded. 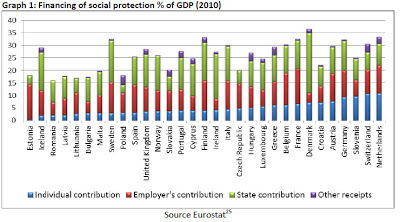 The graph above shows that the UK's welfare system relies heavily on funding by the state through general taxation rather than the greater use of insurance-based contributions (from employees and employers) in many other member states. In addition, in the UK, the amount that can be claimed by individuals is often not linked to contributions, being either means tested or for benefits such as Job Seekers Allowance, effectively set at a flat rate (£71.70 a week). By contrast, if you become unemployed in Germany you could expect to receive 60% of your previous earnings and in Denmark 90%. This is one of the main reasons why the Government is so concerned about migrants being able to claim benefits without having made an economic contribution to the country through work. This is not to say the UK is alone in having concerns about this issue. 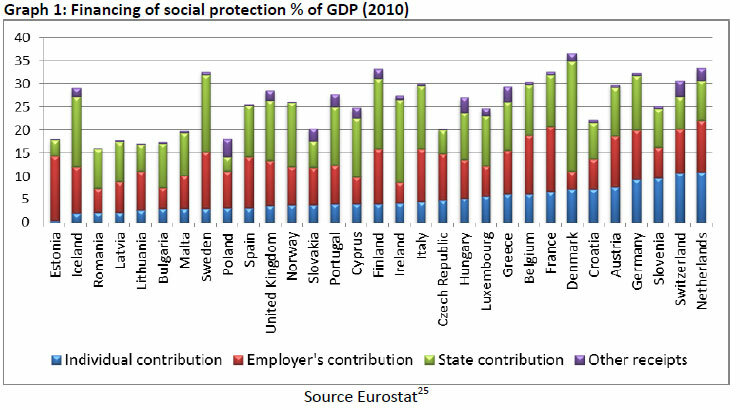 In 2011, 13 national governments called on the Commission to revisit the rules on free movement and social security coordination, in particular "the concept of residence in the context of the interaction of the social security coordination Regulation 883/2004 with other relevant EU instruments, notably the free movement Directive 2004/38." This makes the Commission's decision to take legal action last week all the more difficult to understand. The final section of the report looks at the proposals put forward by David Cameron in March and suggests further options that should be considered when seeking to re-write the EU's free movement rules. What this report shows is that the vast array of different welfare systems at play in Europe requires allowing national governments greater flexibility to protect their particular welfare models. Free movement, as we've said many times before, brings many benefits, but you can only have free movement if there is public confidence in it. Jolly good. Let them fine us. Then let's not pay the fine, as other nations don't. But think of the value we could gain from the publicity!